WHAT DO BED BUGS LOOK LIKE ? Bed Bugs Have Small Flat, Over-Shaped Bodies, Thrley Are Wingless Adults Do Vestiges Of Wings Called Wing, Pads But They Do Not Fully Develop Into Functional Wings. Adults Are Brown In Color, Although Their Bodies Redden After Feeding Full-Grown Bedbugs Move Relatively Showly And Measures Between 4 To 5 mm. 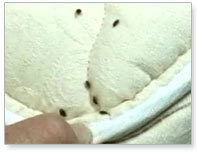 Homeowners Sometimes Have The Misconception That Bedbugs Are Too Small To See With The Makes Eye.The Nymphs May Be Small And Difficult To See, But The Adults Are Detectable With The Makes Eye And May Be Found In The Cracks And Crevices They Use To Hide. Newly Hatched Nymphs Are Approximately The Size Of The Head Of A Pin And Are White Or Tan Until They Feed They Often Are Described As Being About The Size And Shape Of An Apple Ssed. Cockroaches Health Menace! PPCS. cockroaches are the number one pest in homes and buildings, they are frequently carried into buildings in bags or boxes. They can live outside in Electric meters, garbage dumps or sewage systems and then migrate into homes. Cockroaches hide in sheltered, dark places during the day. Because they avoid light, they may not be detected in a home for months. Most homes have many cracks or crevices where they hide. They pollute food or cooking utensils with bacterias and germs.Cockroaches carry bacteria, fungi and filth on their legs and bodies. Their habit of hiding in empty spaces and moving under cover of darkness carrying bacteria is a health menace.